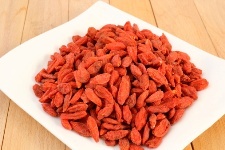 There has been a lot of hype regarding the positive health benefits of goji berries recently. Their advocates claim goji berries are effective for warding off problems ranging from cancer to diabetes, even dementia. Their value, they say, comes from their richness in polysaccharides—a type of carbohydrate that helps provide energy, and also has some impressive qualities when it comes to immune-system strength and overall health. Two very recent clinical studies have put goji berries, also known as wolfberries, under close examination. One, performed at Northwestern Polytechnical University in China, investigated the biological activities and health benefits of goji berries. The fruit has a long history in traditional Chinese herbal medicine, and has been used historically as an anti-fever, anti-inflammation, and anti-senility agent for thousands of years. The experiment indicated that the polysaccharides in goji berries exert various important biological activities, such as antioxidant, anti-cancer, neuro-protective, anti-diabetes, liver protection, anti-osteoporosis, and anti-fatigue activities. Another recent Chinese study examined the protective effects of goji berries on retinal nerve cells. They found evidence that a goji berry extract strengthened photoreceptors and boosted survival of retinal neurons. The researchers concluded that the goji berry extract showed protective effects on retinal cells and could be used in treatment of some retinal diseases. In North America, goji berries are usually found in health food stores. Because of their powerful flavor, they are usually dried and added to other snack foods. Jin, M., et al., “Biological activities and potential health benefit effects of polysaccharides isolated from Lycium barbarum L,” J Biol Macromol. November 27, 2012. Shen, Z.J., et al., “Effect of extract of Lycium barbarum L. on adult human retinal nerve cells,” Zhonghua Yan Ke Za Zhi. September 2012; 48(9): 824-8.